From the ongoing editing for the film Raven Awakens, these are ten separate segments that portray each step of the casting process. These are rough cut segments currently available on Jim’s website as well as being viewable here. As part of the ongoing attempt to bring you deeper into the process (of both the sculpture and the film), I hope that you enjoy these vignettes. 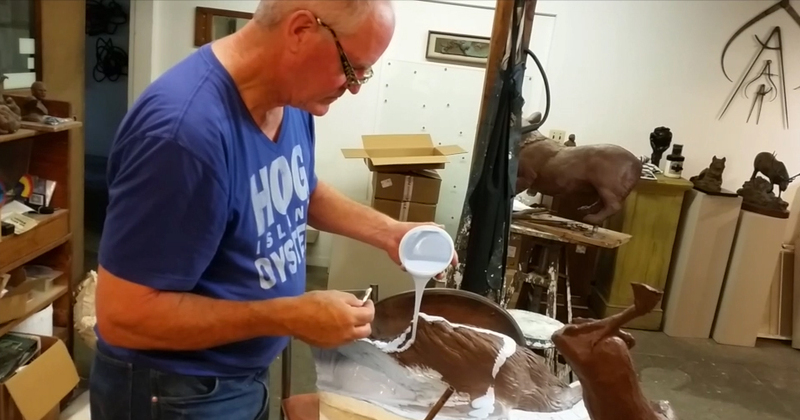 Jim’s casting process is thousands of years old and has remained largely the same throughout all of history. Ultimately, it is simply the creation of a series of positive and negative molds, several models in different mediums, on the way to the final bronze. It is referred to as “Lost Wax Casting” not because the method was somehow lost, but because, as part of the process, a wax pattern is created and then subsequently “lost” (burned out). The underlying structure of the sculpture is created in metal (the armature). 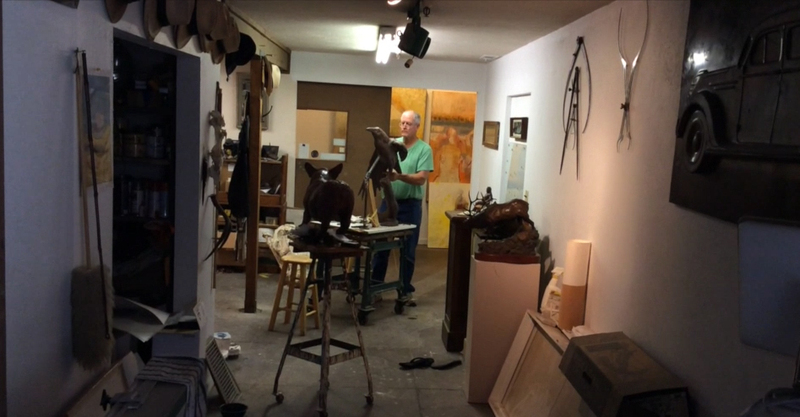 The armature is where the initial line of the sculpture – the basis for all that will come after – is created. This armature is subsequently covered in clay and sculpted to the form desired. 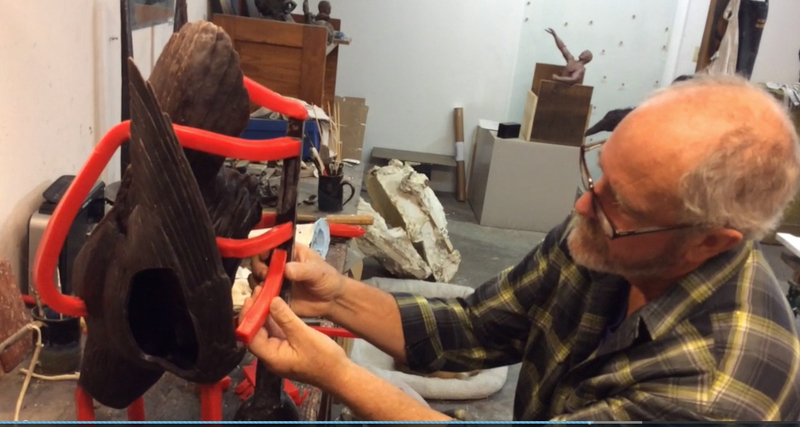 Following completion of the original sculpture it is time to create the first mold. 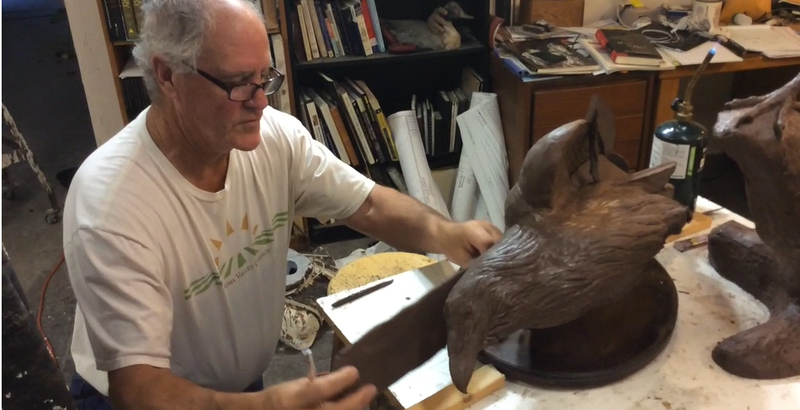 To begin the process, several layers of rubber are applied directly to the clay sculpture. Once the rubber sets a backup shell or “mother mold” is made as a support for the rubber. 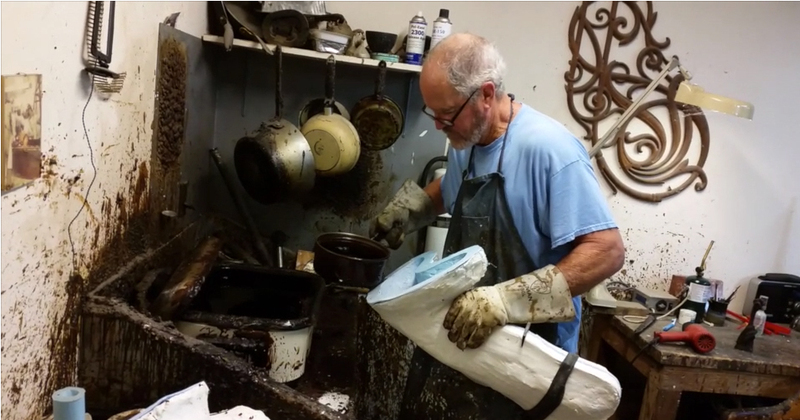 The rubber mold is removed from the original clay, the mold is reassembled and wax is poured in. 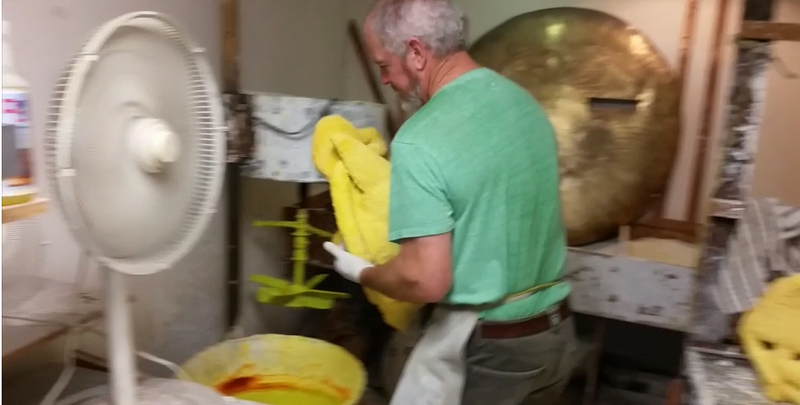 The mold is rotated until an even thin coat of wax is obtained. After the wax has completely cooled the back up shell and mold are removed and the wax casting is revealed. The wax is cleaned; seam lines and any slight air bubbles that may have occured in the wax pouring process are removed. Wax gates and sprue bars are attached to the sculpture along with a pour cup. This creates a plumbing system that allows the wax out and the bronze in. The prepared wax casting is dipped into a liquid slurry and covered with a fine sand. Once it has dried, the process is repeated. 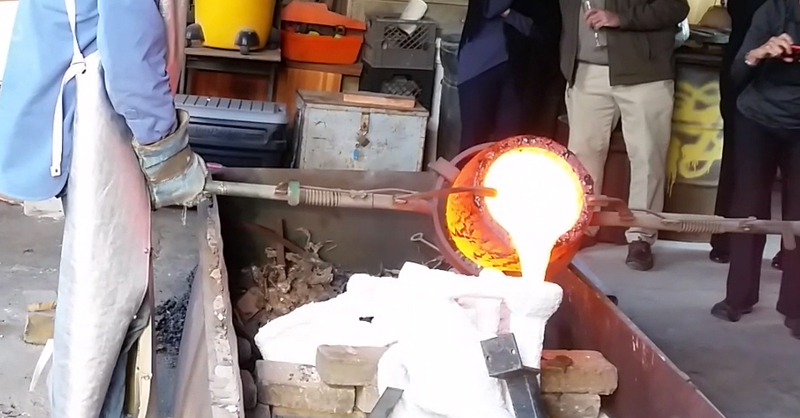 This process is repeated until the shell is strong enough to withstand the molten bronze. This ceramic shell goes both inside and outside the wax thereby allowing the bronze sculpture to be cast hollow. The ceramic shell is placed in a kiln where the shell is baked and the wax is “lost” as it melts, flowing out of the shell as it is heated. Once the shell is de-waxed it is cooled and inspected for cracking or defects. 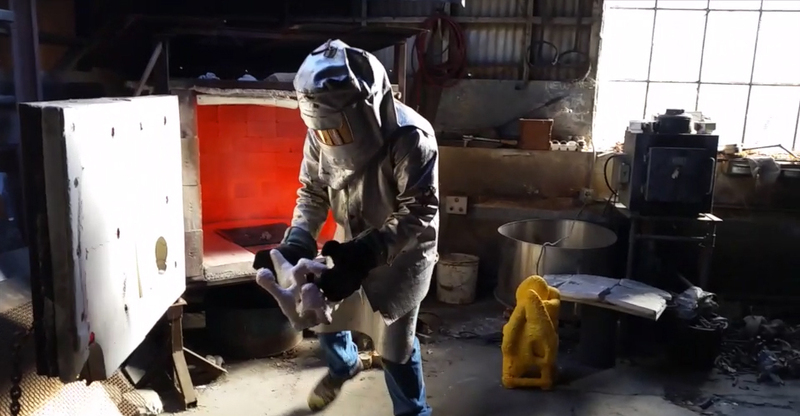 Next, the hollow shell is placed back in the kiln, reheated and placed in the pouring pit where molten bronze is poured into the shell. 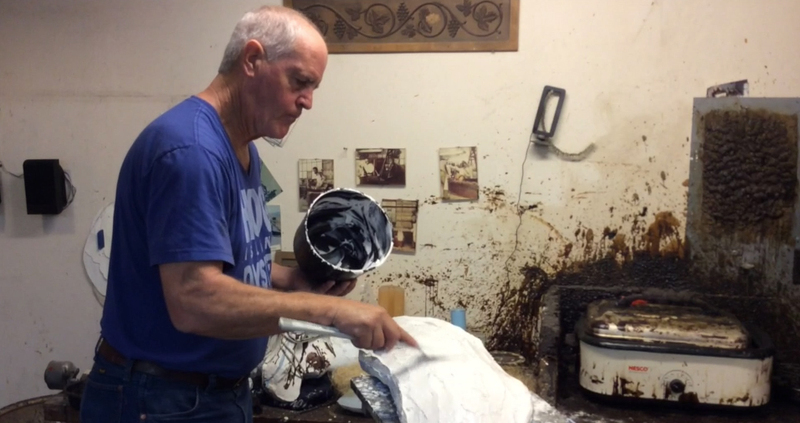 The bronze is allowed to cool and solidify. The bronze parts are now reassembled and welded together. 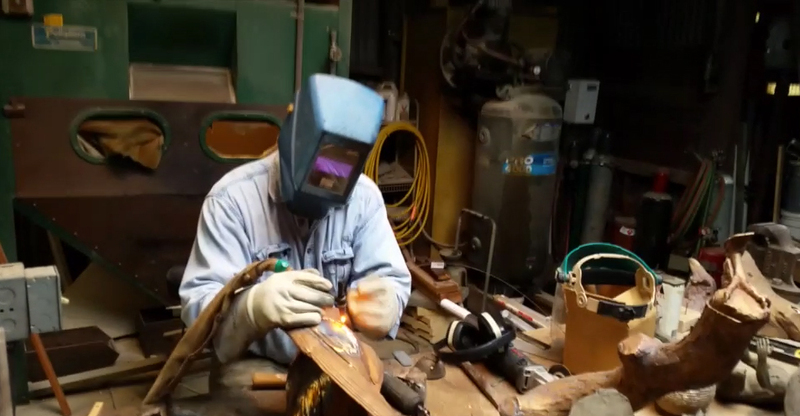 The sculpture is then chased to remove any sign of welding. Several different sanding and detailing tools are used to give the most accurate surface possible. The patina is the finishing color. A variety of chemicals are used in order to achieve the specific coloring desired for the piece. After the patina is applied the sculpture is sealed with a wax coat to protect the finish.